You don’t have to walk on egg shells at the expense of your own feelings. Your views and emotions matter and are as equally valid as the next person. It’s another day to stop being the door mat! If you’re not in a place where you’re being valued, than perhaps it’s time for a change. Either start standing up for yourself and stop letting others put you down. Or move the negative people and places out of your life. You’re the only one who can change things for you. So stop making excuses and get to it. You can’t take care of others at the expense of yourself. You’ll wear yourself down and have nothing left to give. Remember that burning the candle at both ends, leaves nothing left for you and will knock you off your feet. If you’re laid up sick and exhausted, you’re not going to be any good to those around you. Wands represent the essence of Enterprise & Inaction, Inspiration & Pessimism, Distinction & Disregard. 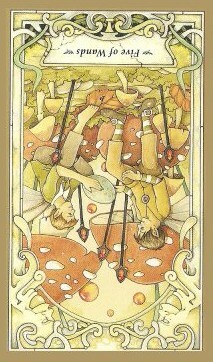 Utilize the magik of wands to implement your inspiration to attain distinction for yourself. Get up off your knees, stop begging for what you already deserve and end the bullying or manipulation of your thoughts, ideas and work. Time to stop seeing the things you need or require as a selfish expense or action. It’s ok to say “No” when you’re trying to take care of yourself. If someone gets mad because they “expected” you to do what they wanted, remind them that they have no right to place their expectations on you or your day. They have their own lessons to deal with and learn. You don’t need to sacrifice yourself to appease or save them. They asked a question, the answer was no and it’s their problem if they choose to get angry over it. Helping others can be a noble deed and show great compassion for those in need. But not when it’s your last dime or the shirt off your back. You need compassion and care too, so time to start showing yourself some of that. If you don’t show it to yourself, no one else is going to show it to you either. By the same token, don’t take the attitude that you’re so tough and strong that you don’t need help from others. That pride isn’t selfless or endearing. It only makes you weak, because you don’t have the courage or confidence to accept the gifts of love and compassion from those who care about you. That’s the real selfish act. So don’t deny others the good feeling of giving you something. Remember that life is about balance. We can share the path with those we love and do our best to care for each other. But that means caring for ourselves to remain healthy in Mind/Body/Spirit so we have the ability and energy to care for others. It also means allow others to give something back to us for all we do for them. Too much of a good thing is bad for you. No matter what it is. Time to balance out the scale and put some effort into building yourself up and taking care of your self. Even if that means standing up for yourself, or allowing someone to take care of you.